We are located at the NE corner of North 4th Street and Avenue B in downtown Bismarck, one block south of Avenue C, one block east of North 3rd Street, and three blocks north of East Rosser Avenue in Bismarck, North Dakota. Parking is available on the street or in two dedicated weekend lots, one directly east of St. George's which is accessed from Avenue B, or one to the north and east of St. George's which is accessed from North 5th Street. 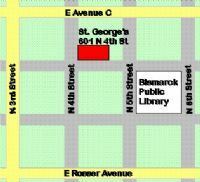 Another easy reference point is the Bismarck Public Library, which is located on North 5th Street, between Avenues A & B.